Ugh- allergies. 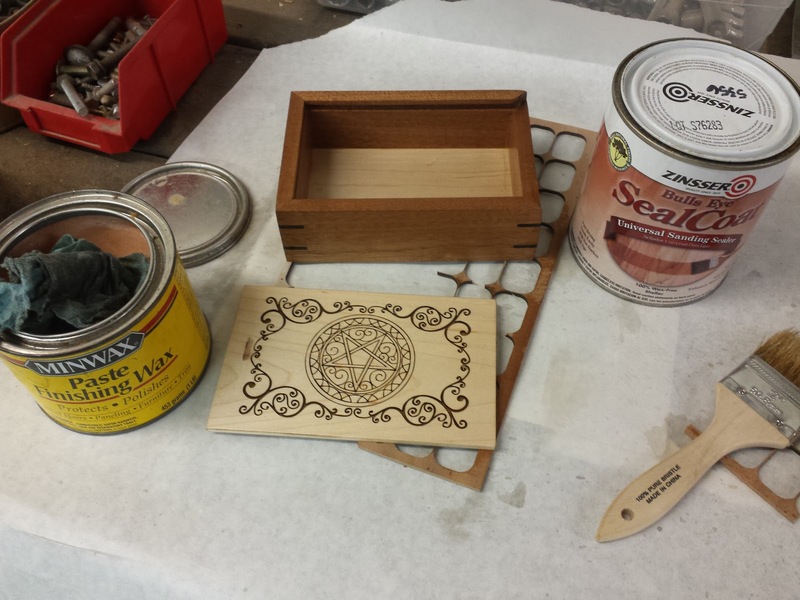 I have come to find that if I don't use a respirator when I'm doing wood working, even just a little bit, I will get an allergy attack. And now, I have runaway sinuses, because last night... I did a thing. 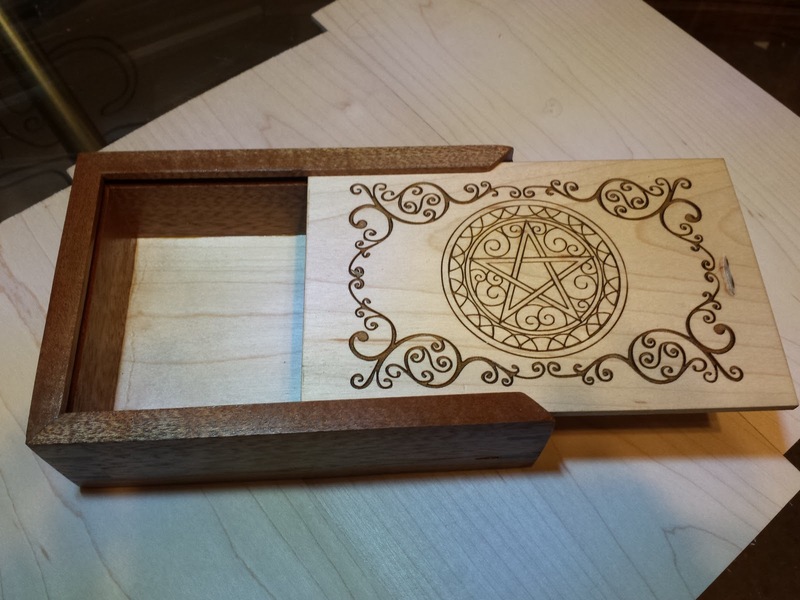 This is a tarot card box, with splined mitered corners and a pencil box sliding top. 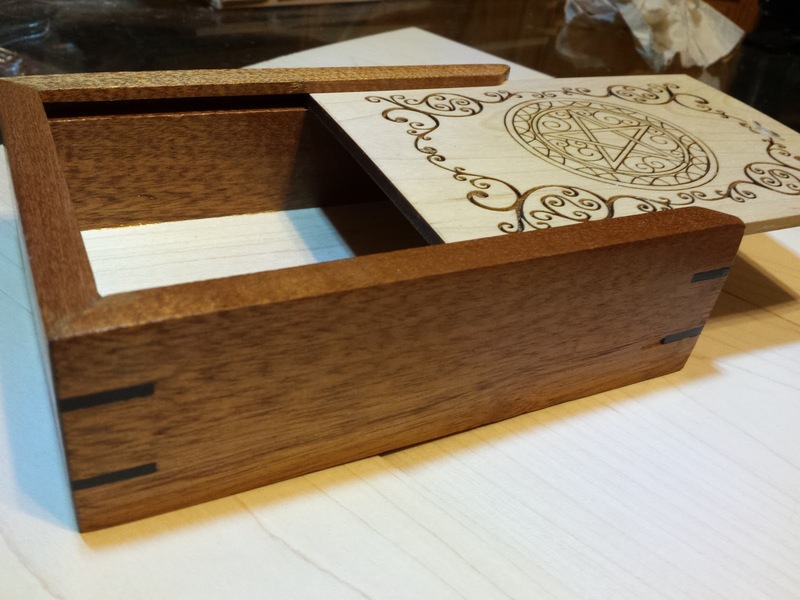 The sides are made from sapele. 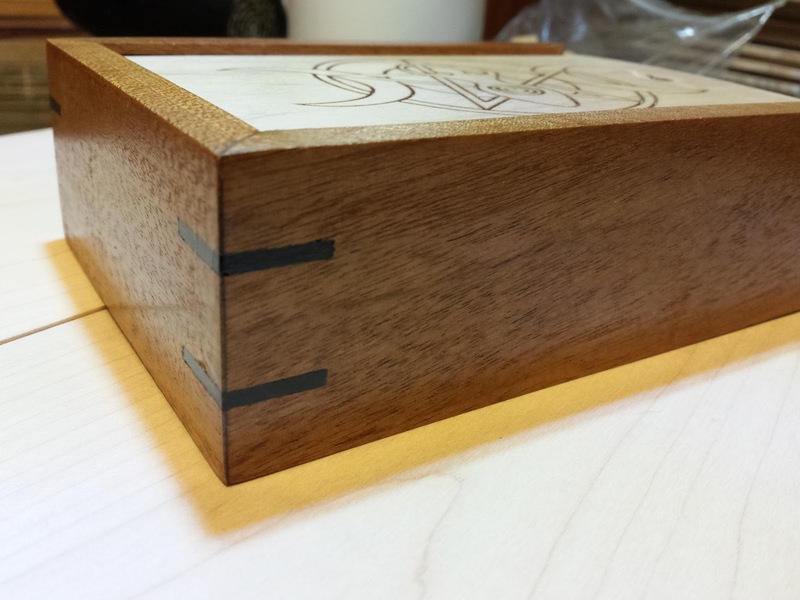 The top and bottom are soft maple, and the splines are black ebony. 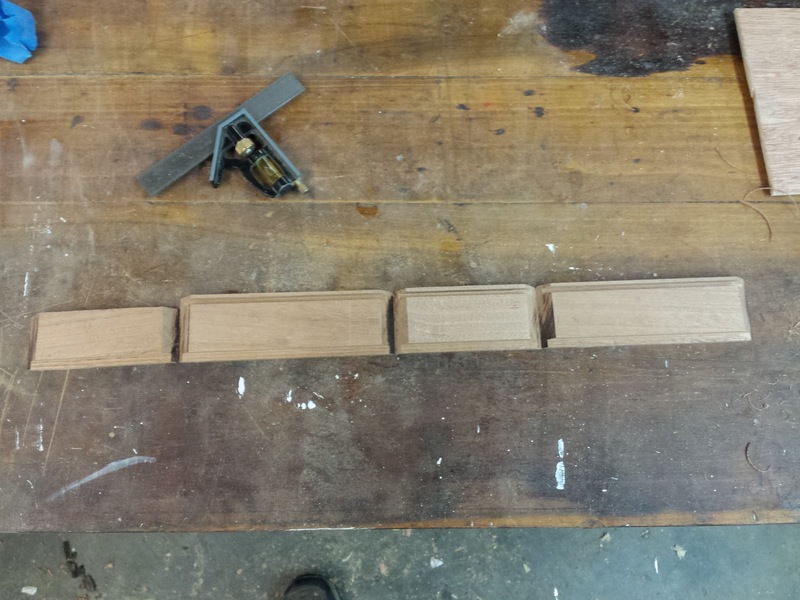 It all stared with a piece of sapele. It looked pretty straight, but it rocked on the table a little bit, so I used a hand plane and a planer to take the small twist out. 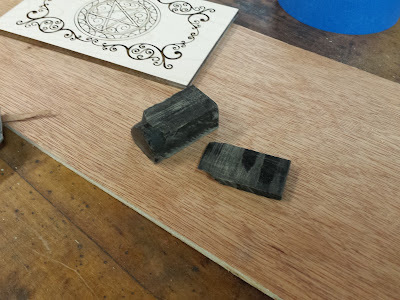 Truth be told, I probably caused more damage with the hand plane than I did good with it, but at least the twist was lessened. 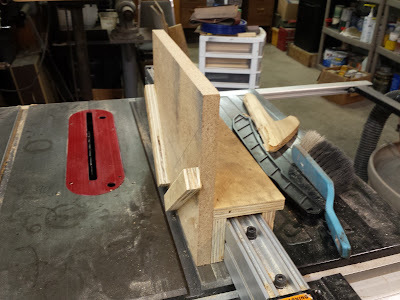 Next, I re-sawed the board on the band saw to split it in half. 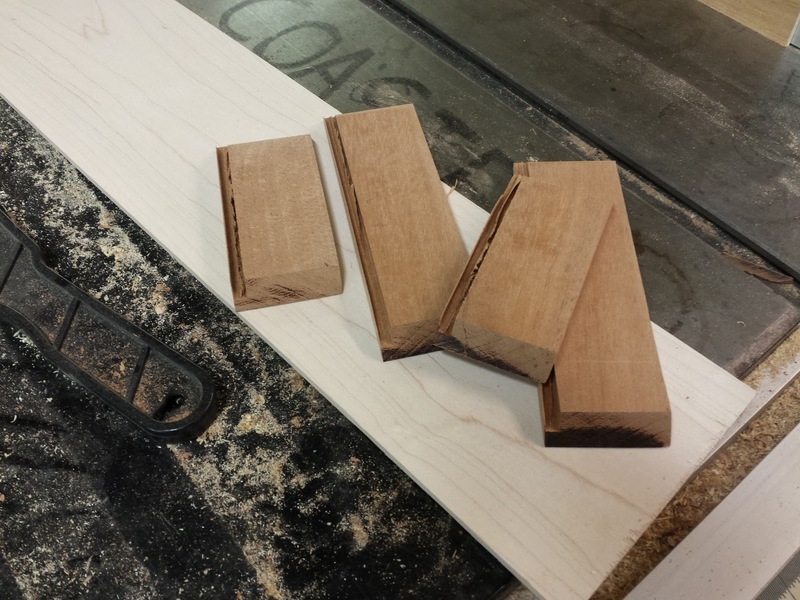 Of course, then I had to run it through the planer again to smooth out the band saw marks. Once both sides of both pieces were nice and flat, and both pieces were the same thickness, I started cutting out the pieces for the sides of the box. 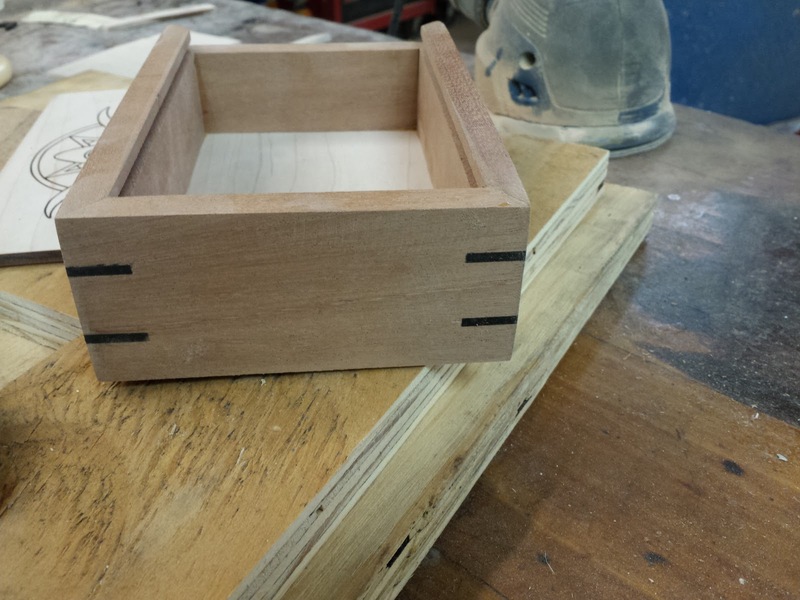 There is a trick to the way you cut the pieces from the stock in order to create a continuous grain pattern all the way around the box. 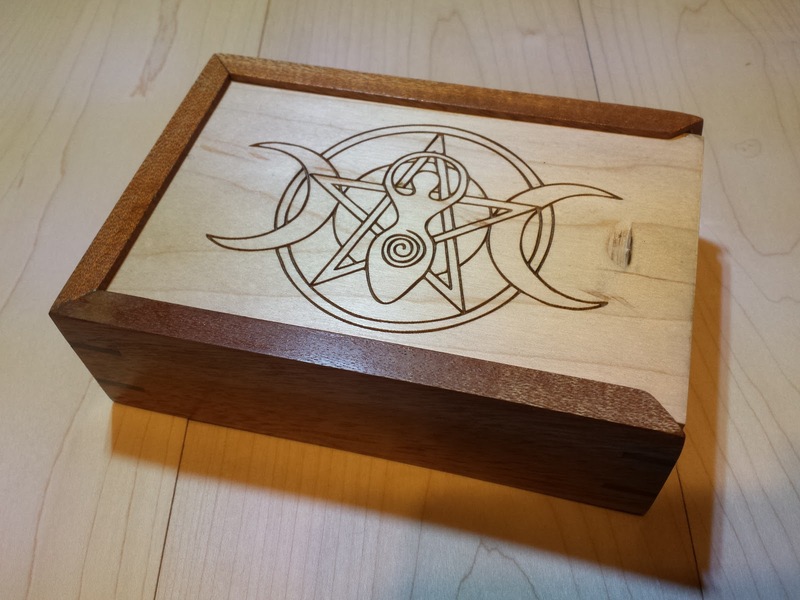 Oh, it's worth mentioning that this is the first time I've ever tried to make a box like this. Actually, it's only the second time I've ever tried to make a box at all. I made a few finger jointed candle boxes when I first started getting into wood working. So, this being the first time trying to do the whole continuous grain thing (or even the whole splined mitered box thing), it didn't quite go to plan. I must have misjudged the length of the sides, because when I got to the last piece, the remaining board wasn't long enough. I had planned to make one 4"x6"x4" box from each of the two book-matched boards. 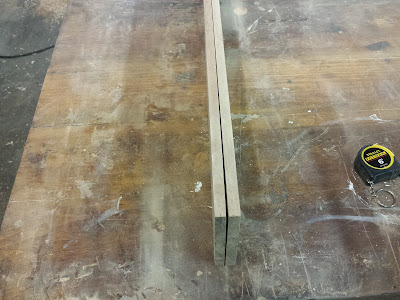 But I had to cut a piece from the second board to make up the shortfall. 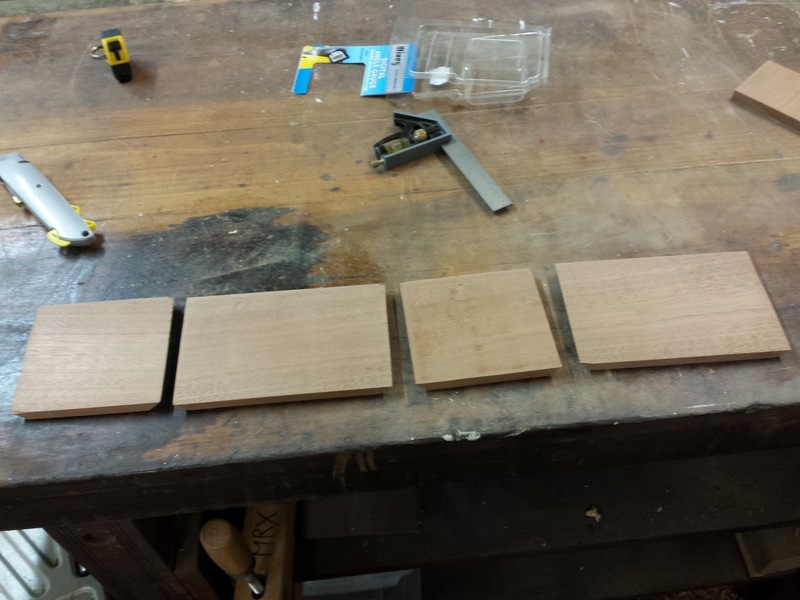 This means that three of the sides will have continuous grain, and the fourth will be mismatched. Luckily, sapele does not have a very pronounced grain pattern, so it won't be very noticeable. The next step was to cut the 45 degree miters on each piece. There was some burning during the cut because the table saw blade was dull. I eventually changed it, but I should have done so sooner. I test fitted the four pieces together, and the miters came out pretty good, but I noticed that the box seemed really tall. 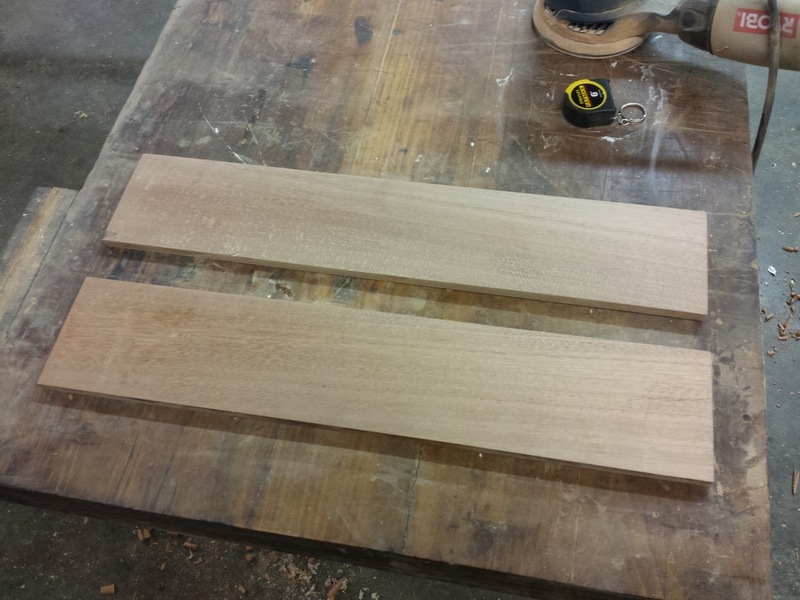 I was kind of bummed that I wasn't going to get two boxes out of this piece of sapele, do to the fact that I had to take that fourth piece from the second half of the board, so I started thinking, maybe I can cut the height in half. 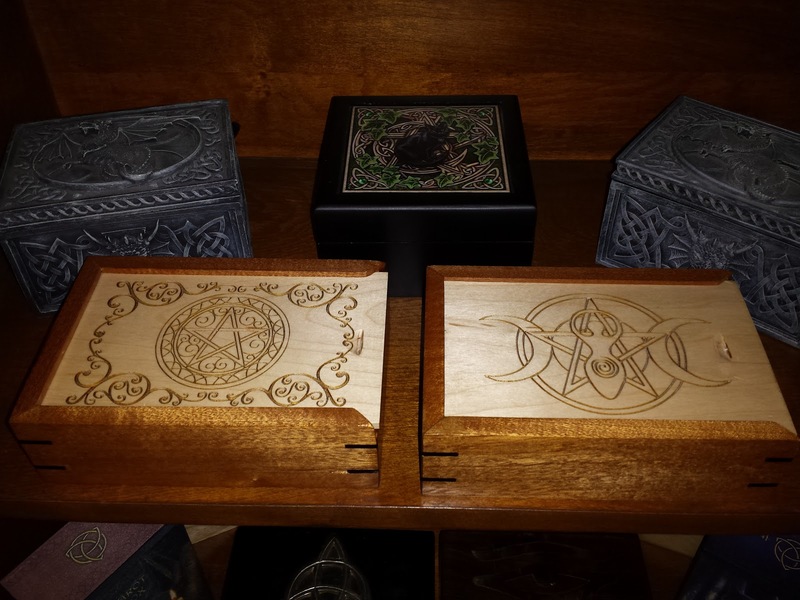 That would give me two boxes that are only 2" tall. 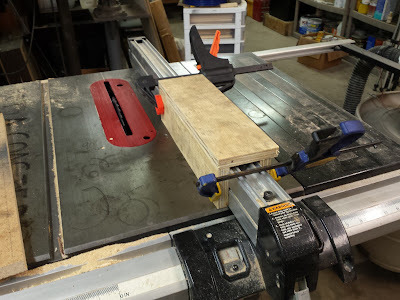 I wasn't sure if that would be enough height to be useful, but I was willing to give it a try, so I marked the half way line and cut it in half on the band saw. The table saw would have given me a straighter cut, but would have taken up an eighth of an inch in the kerf. 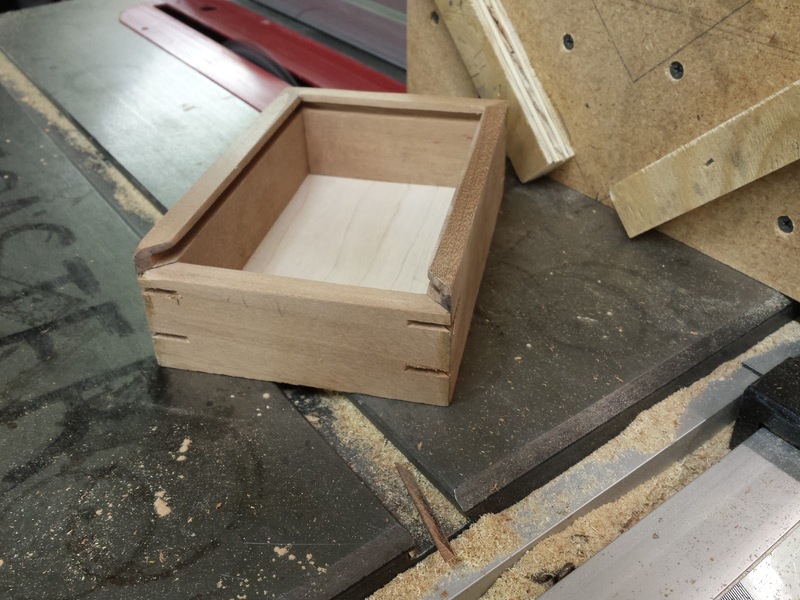 I couldn't afford to loose that much height, so I cut very carefully on the band saw and sanded the sawn edge flat (which I then used as the bottom edge of the box). I had originally planned to use a 3/16" dado for the lid and for the bottom of the box, but in order to save some of the height of the interior of the box, I decided that the bottom could be rabbeted in. This would save about 3/16" of interior height. 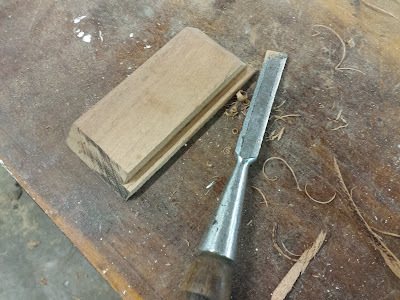 I was using a 3/16" thick plank of soft maple for the lid and bottom, so I made two passes with the saw blade to create the rabbet, then cleaned it up with a chisel. The rabbet was made just a hair wider than the thickness of the bottom panel, so that the box would rest on the bottom edges, not on the bottom panel, and so I would have some edge to sand in order to true up the bottom later. Then I needed to make one more cut to make the dado in which the lid would slide. 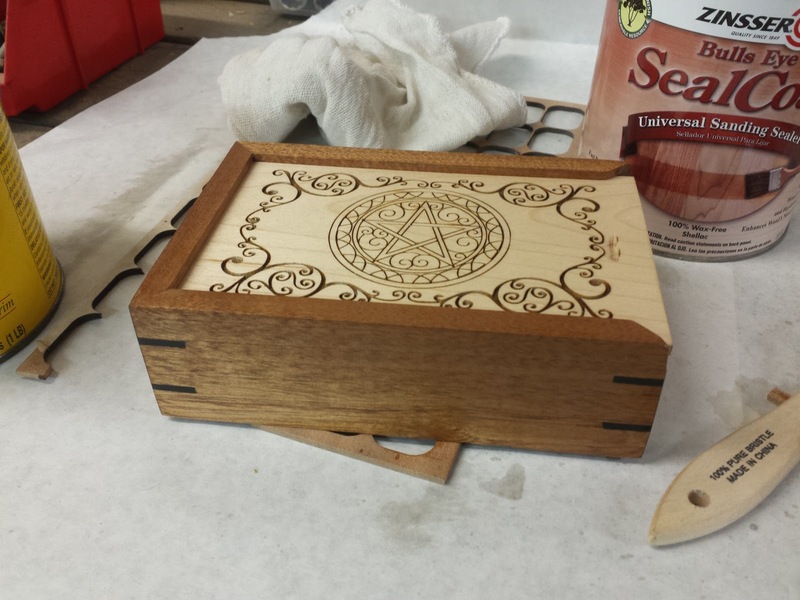 This was also done with two passes of the table saw blade (which is nominally 1/8" thick). 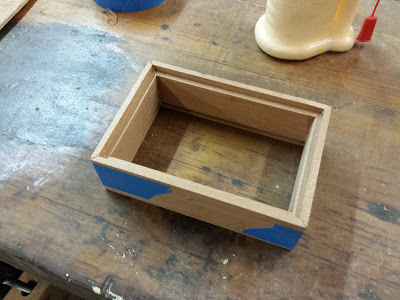 The first pass established the lid's distance down from the top of the box. 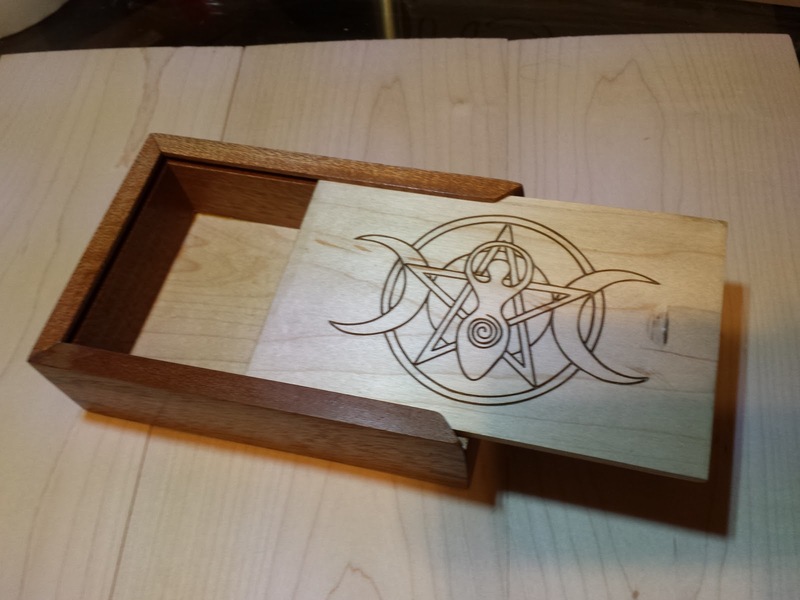 The second pass widened the dado to fit the thickness of the lid panel. The fourth side had to be cut a little differently. It didn't get a dado. It got cut off at the height of the dado, so the lid would slide out through this side, and not be captured by it. 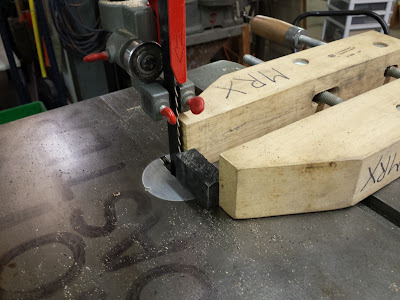 So, I cut this one last, and just raised the height of the blade while making the second pass to cut all the way through the piece. 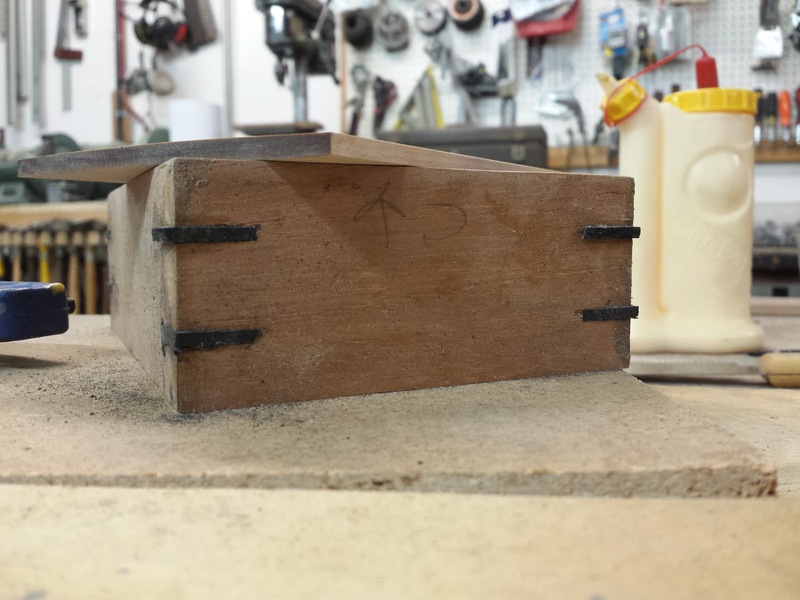 Finally, it was time for glue-up. 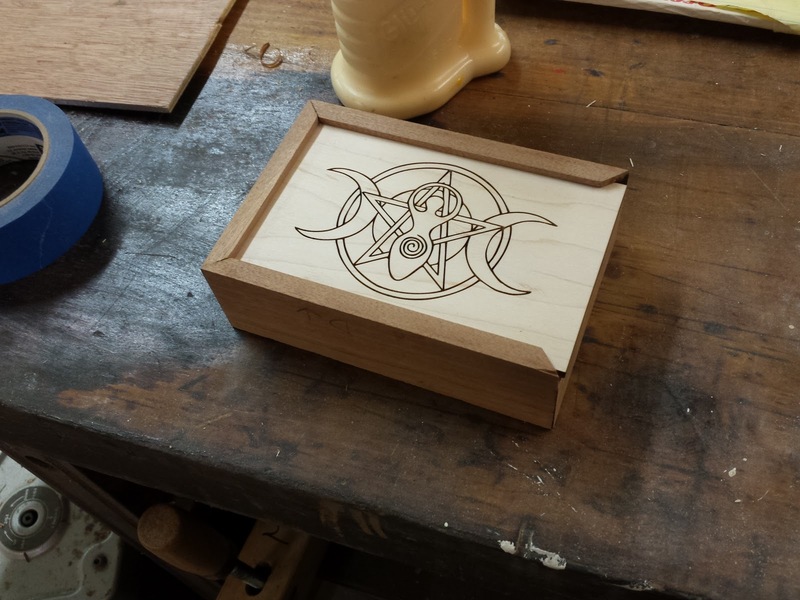 This is where it really started to look like the beginnings of a box. I laid the pieces end to end, using a square to make sure that the edge of the bottom rabbet of each piece was perfectly in line. 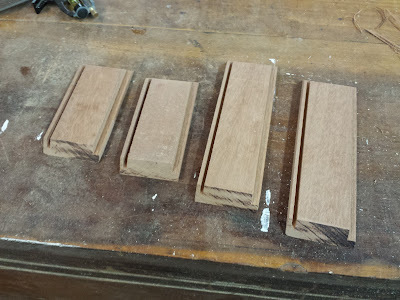 Inconsistencies in top and bottom edges of the pieces could be sanded out later, but the rabbet and the dado needed to be perfectly in line at this stage. 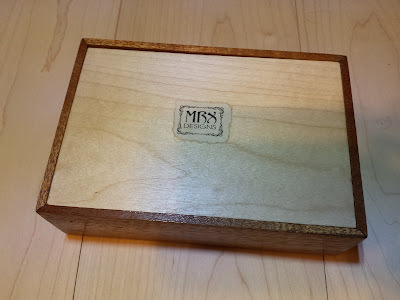 I connected the pieces with masking tape at the seams along what would be the outside of the box. I put wood glue along all the mitered edges and rolled up the box ends, taping it shut. 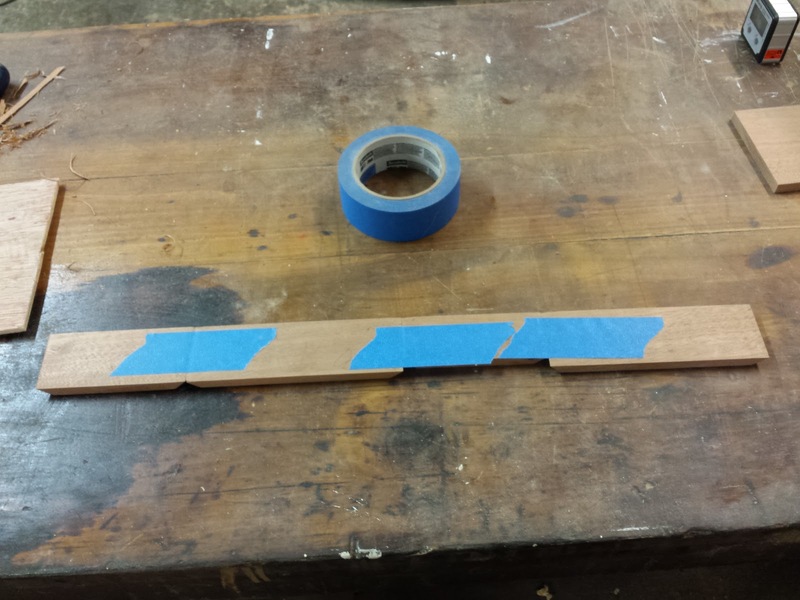 This method holds all the edges in perfect alignment, and the tape also acts as a clamp for the glue. Just use a square to make sure the corners are perfect, and give it a little squeeze in the right direction if they are not. No other clamping necessary. 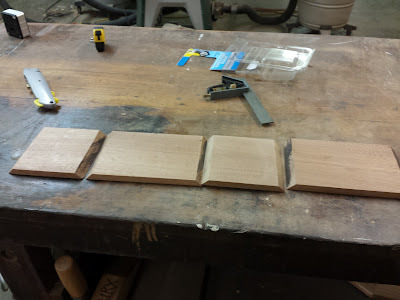 While the glue was drying, I started working on the top and bottom panels. These I made from pre-sawn 3/16" thick planks of maple that I got from my favorite lumber store, specifically because they are great for use in my laser cutter. They got cut to rough size, then sanded, then covered with transfer tape (it's like masking tape) to prevent smoke staining. 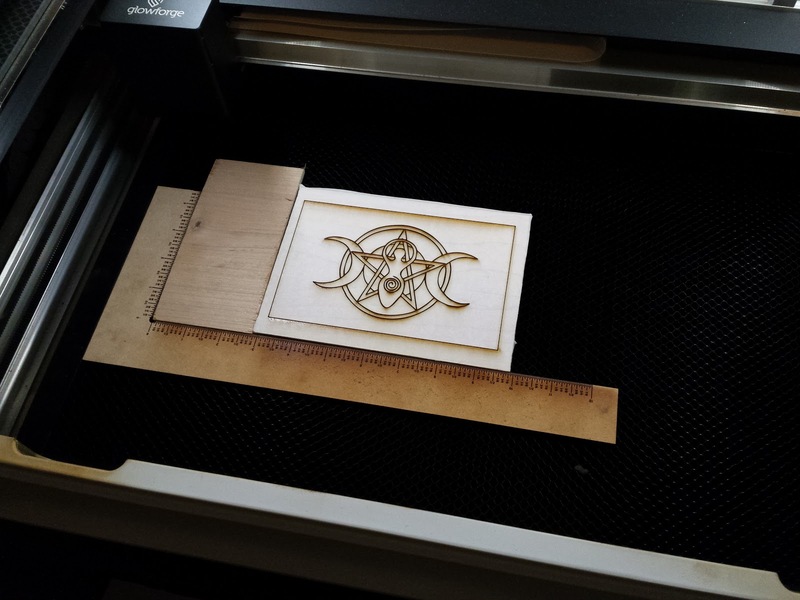 Then I worked up a design for the box tops in Inkscape and cut it out on the Glowforge. 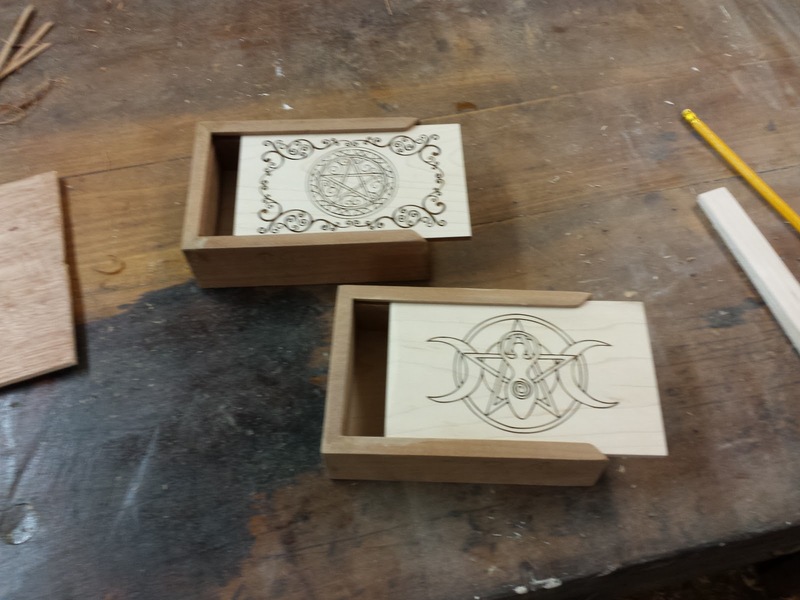 I was making two boxes at once, so I made two different designs for the box tops. 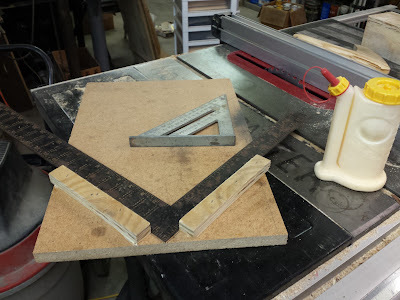 I had previously measured the actual dimensions of the rabbet in order to determine the dimensions of the top and bottom panels. 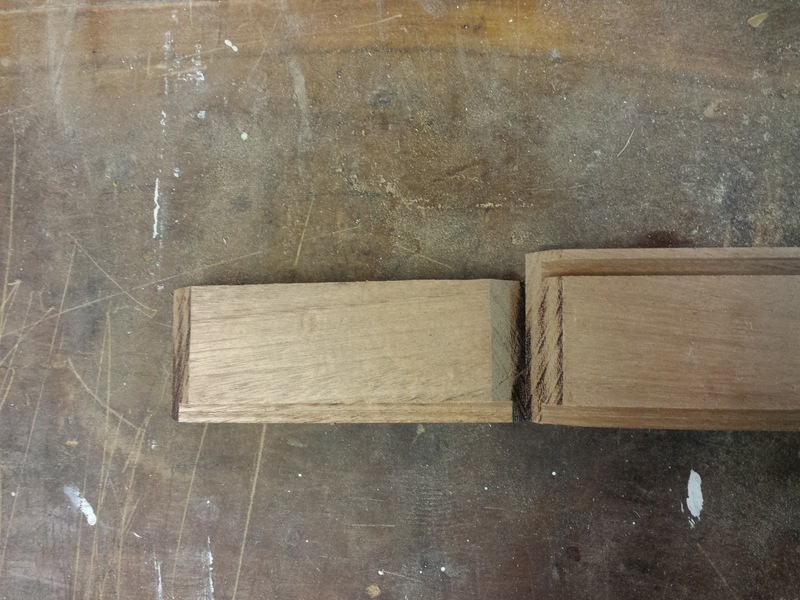 Since the rabbet and the dado were cut to the same depth, the top and bottom panels should be the same dimensions. I test fitted the top and bottom panels. The bottoms fit OK. 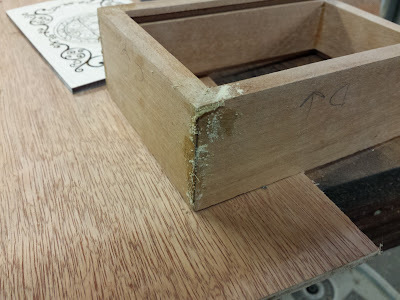 Some small gaps probably caused from the box sides being slightly out of square, but acceptable. The lids would need a little massaging with the sander to fit properly. 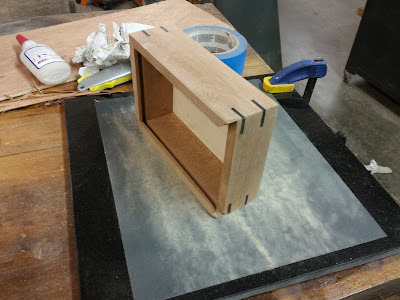 I glued in the bottom panel and let it dry under weight, but before that, I used some sanding dust and wood glue to fill in any gaps in the mitered corners. 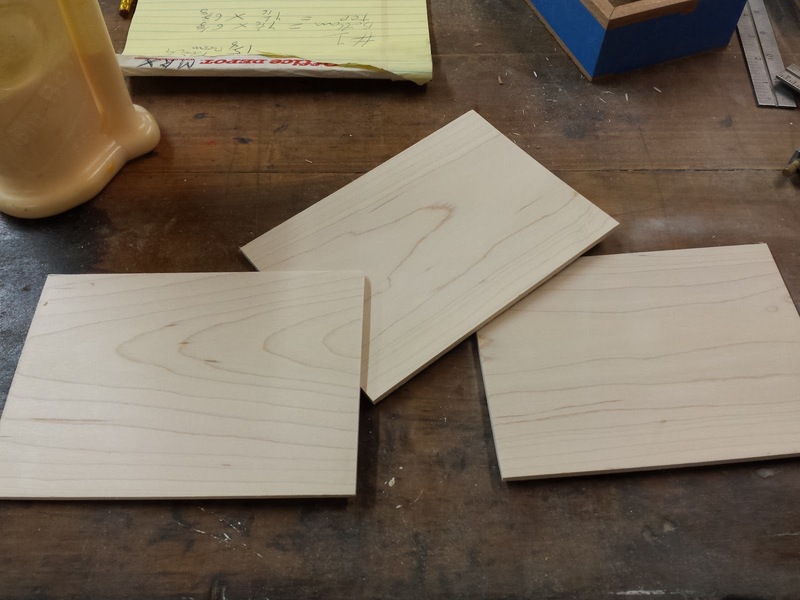 This would be sanded smooth later. 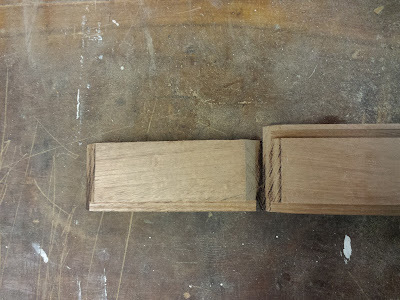 At this point, I needed to make a decision about whether or not to use splines on my miters. I had intended to, but it sure was tempting to just leave them as is. Tempting because adding splines means a whole other level of complexity, and another set of operations with which I had no experience. Basically, it meant another chance for me to screw something up. But ultimately, I decided it was worth it, so I soldiered ahead. There was just one problem, I had my mind set on a dark wood for the spline material, and the sapele was already pretty dark, so I turned to using ebony for the splines. 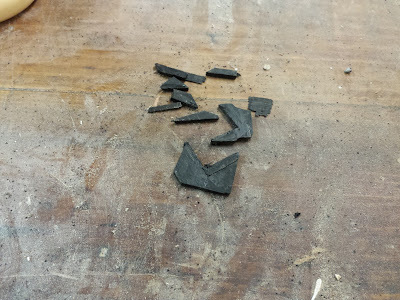 But I only had a little 1.5"x1"x1" nub of ebony left over from turning pendulums. 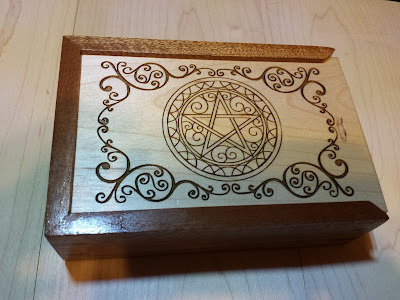 Well, I had more ebony, but I didn't want to bust it out, because it's expensive and I'm cheap. So I forced myself to try to get sixteen splines out of this little nub. Did I say one problem? I meant two. Two problems. 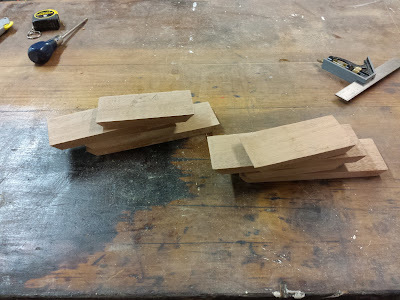 The second being; I don't have a spline jig. 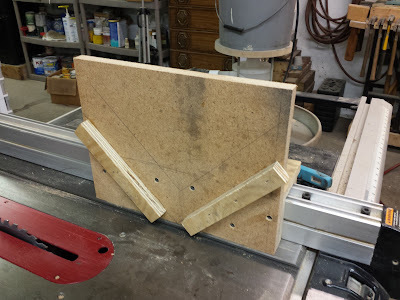 I had never made a spline jig before, but I had seen several of them used in various videos on Youtube (here, here and here). So I re-watched the video with one of the simpler designs, and got to it. I started by cutting some scraps of 3/4" plywood to make a long arch that would slide over the rip fence of my table saw. 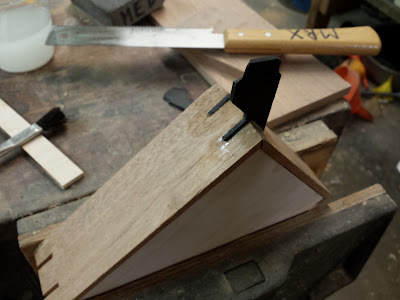 The side pieces were lightly clamped to the fence for a snug fit, and the top was glued on and stapled from the top with 1" crown staples. Then I trimmed and squared up the edges of a scrap piece of MDF to use as the face of the jig. I found the mid point and set a framing square with the corner touching the bottom edge at a 45 degree angle. I used a speed square along the bottom edge of the MDF to ensure the angle was 45 degrees. 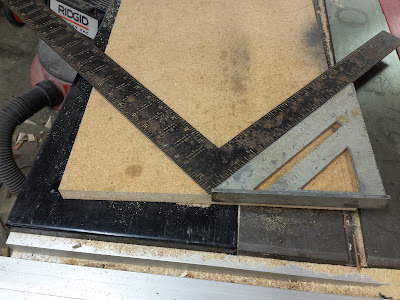 Then I carefully removed the speed square and replaced it with two scraps of 3/4" plywood, 1" wide and about 5" long (the dimensions really don't mater). 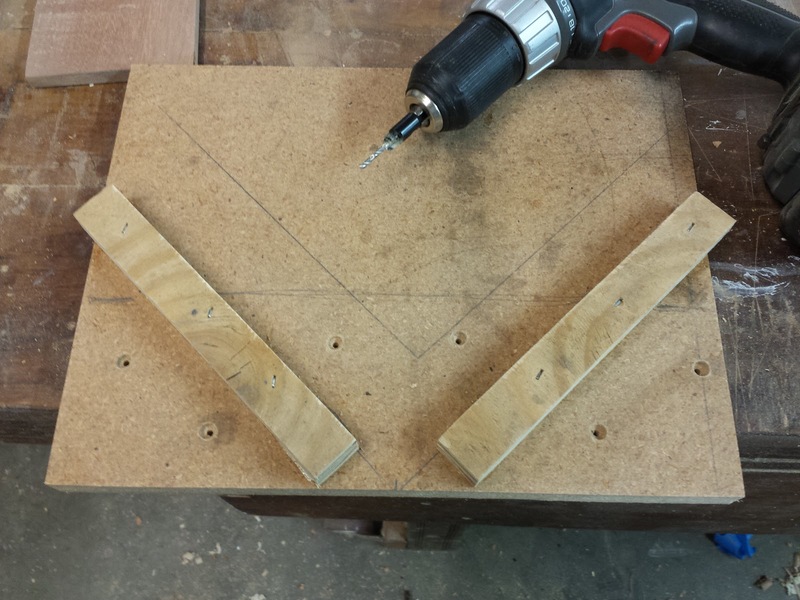 Those got glued in place, on either side of the framing square, forming a "V". 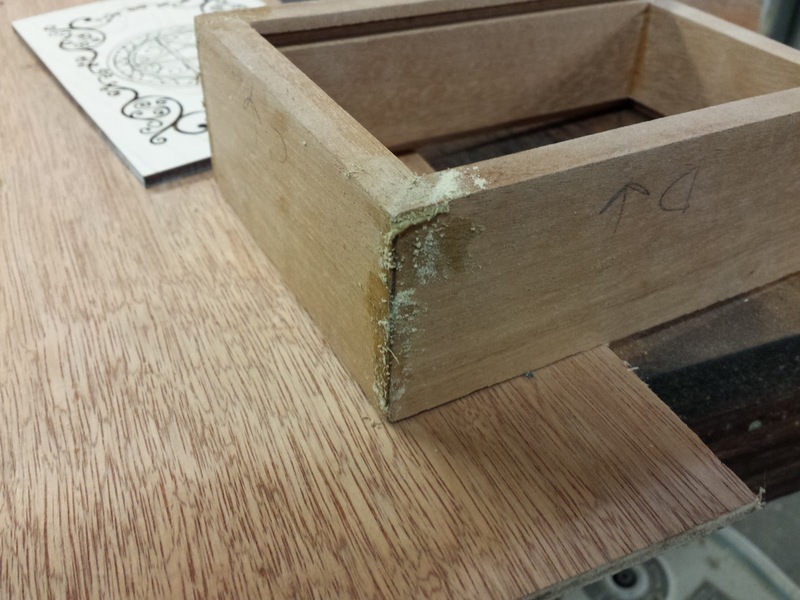 They also got 1" crown staples to clamp them down while the glue dried. I made sure to keep the staples away from the bottom end of the scraps, in case I ever needed to run the saw blade that high and through the "V". I probably would never need to, but now I won't hit staples if I ever do. 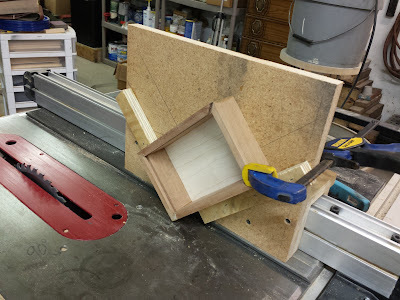 The MDF face plate was a bit tall, so I cut it in half before attaching it to the shuttle (the part that slides over the fence). I wanted to make sure I could remove the face plate if I ever decided to change it (so I wouldn't have to re-make the shuttle) so I didn't use any glue to attach it. 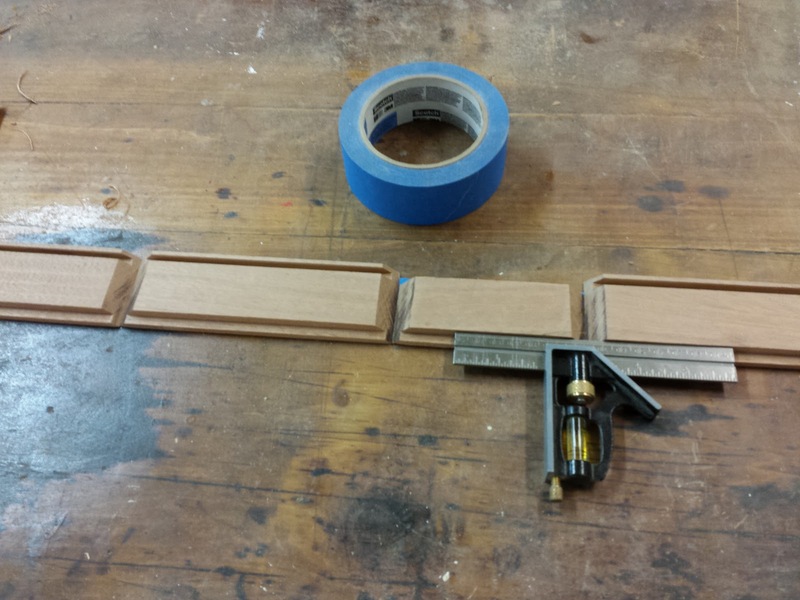 I pre-drilled and countersunk for screws and screwed it to the shuttle with 1.25" course decking screws. And that's it. 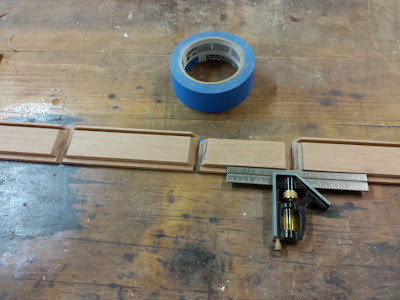 That's how you make a simple spline jig. 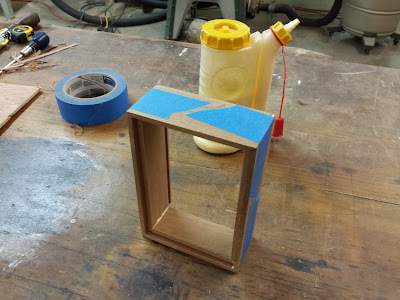 Just rest your work piece in the "V" and hold it to the faceplate. Adjust your fence to align the blade with where you want your splines. 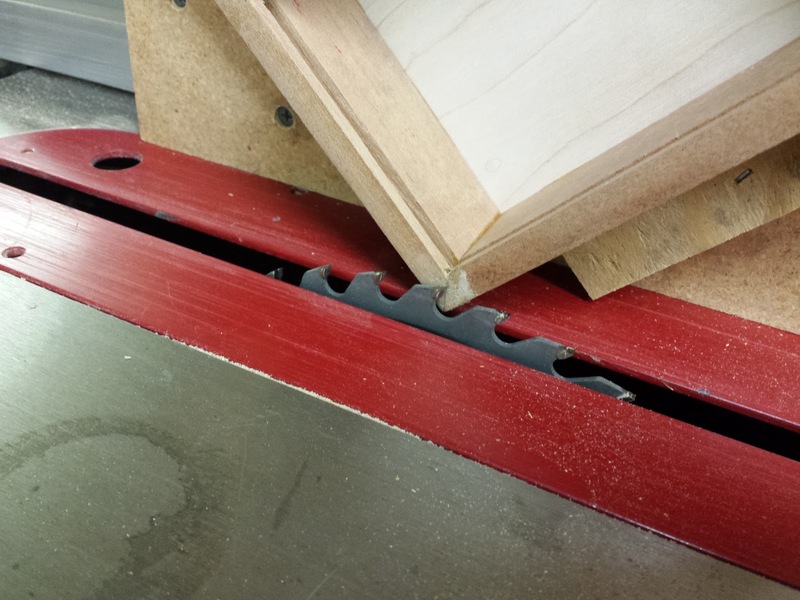 Set your depth of the splines with the blade height, and run the shuttle along the fence to cut your slots for your splines. PRO TIP: use a sharp blade and go slow to avoid tare out, and if you have the option, use a blade with a flat ground tooth. 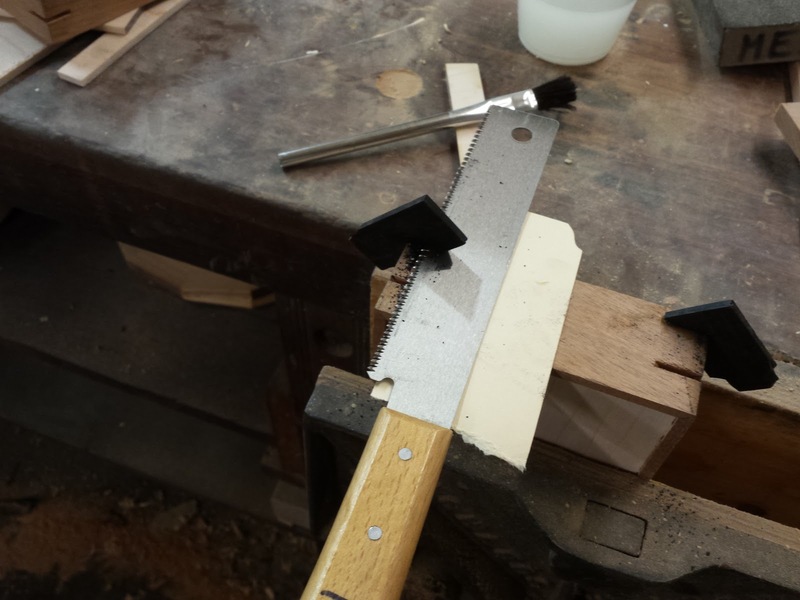 I didn't have one, so standard combination blade it is. OK- So there's your bonus post for the day. I hope you enjoyed it. 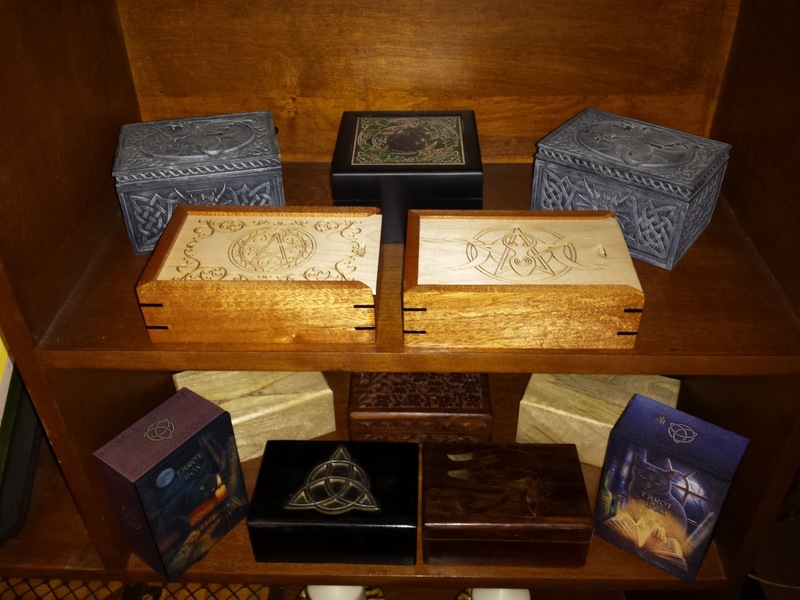 Now, back to the splined boxes. 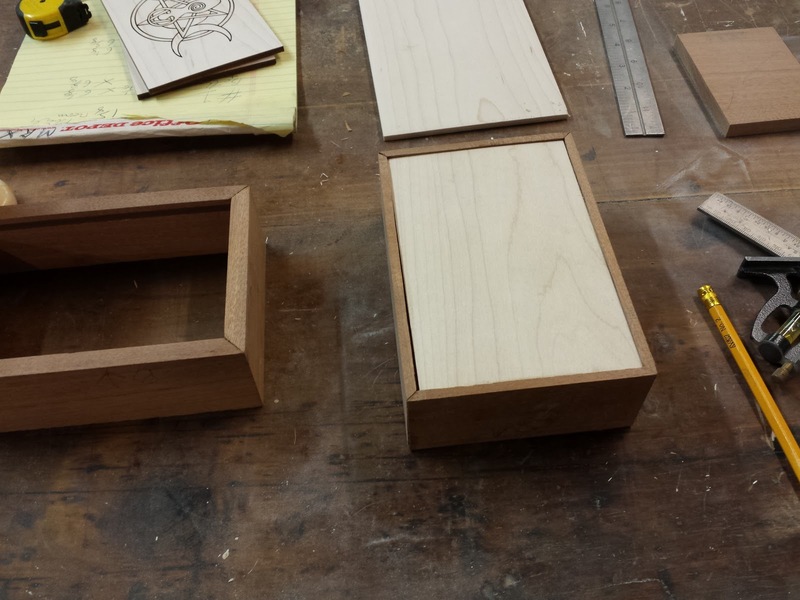 Here is the box, all slotted up and ready for splines. 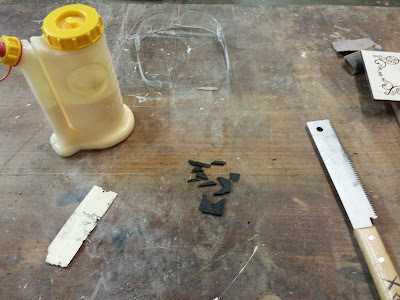 As you saw in one of the pictures above, I cut the nub of ebony into slices on the band saw. 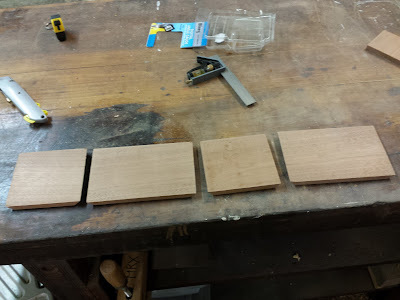 What you didn't see was me sanding the crap out of those slices to make them fit into those slots. Once I got them to the proper thickness, I glued in the splines, just a couple at a time. 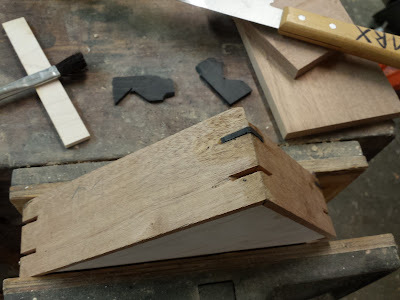 Then, after the glue set, I would cut them with a small flush cut hand saw, and then reuse the left over slice of ebony in another slot. 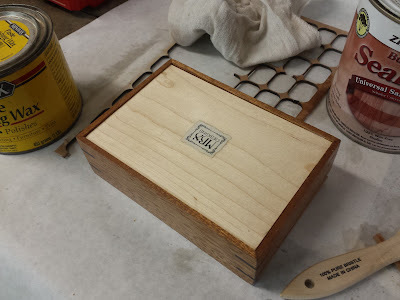 I used a scrap of card stock under my saw to make sure I didn't mar the surface of the box, and provide a little extra clearance, but this probably wasn't really necessary. I repeated this process until all sixteen splines (two per corner on two boxes) were in place, and in case you're wondering, here is all that was left of that nub of ebony when I was done. 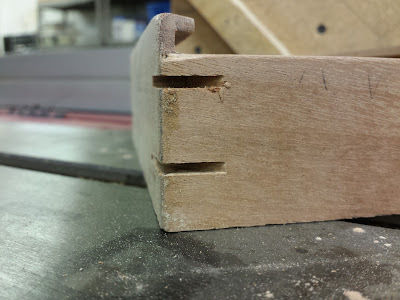 I could have maybe made one more spline out of it. Now that's what I call, getting my money's worth! 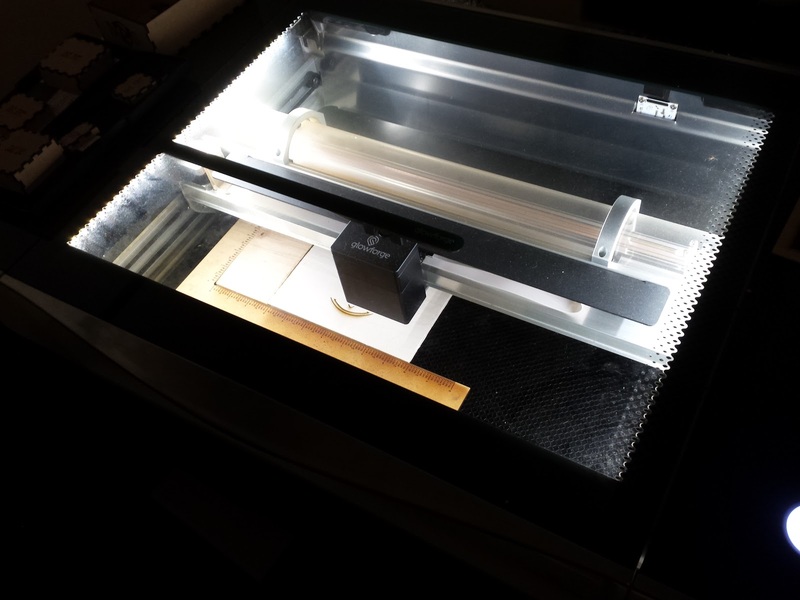 With the splines in place, we're almost finished. 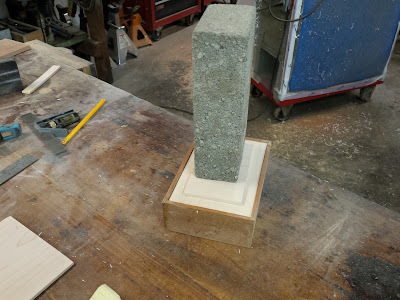 I sanded the splines flush with the sides of the boxes on the disk sander, then I sanded the whole box up to 500 grit with the orbital sander and a sheet of sand paper glued to a flat granite tile. I had to do a bit of sanding on the lids too, to make them fit properly. 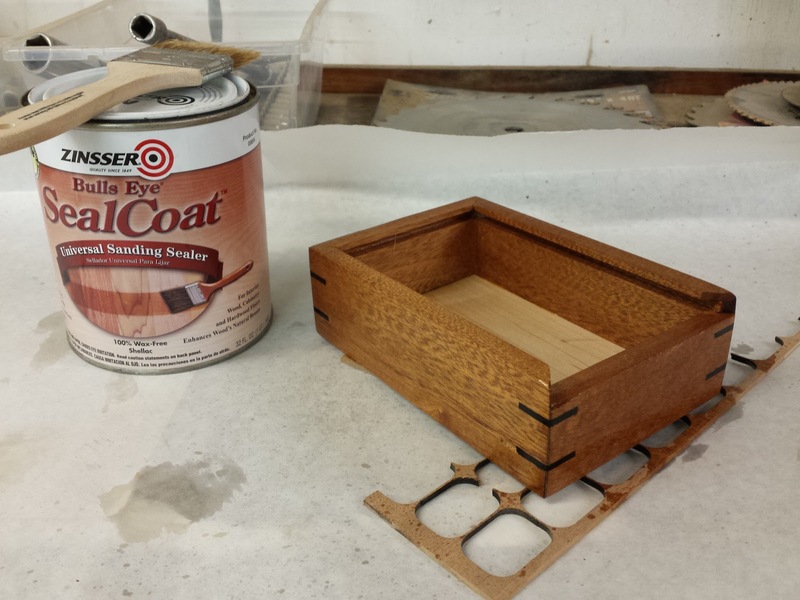 Then each box and lid got two coats of shellac, with a very light sanding in between. Once that was dry, I put on a coat of paste wax, especially along the edges of the lids where they will slide in the dados. The final touch was my logo added to the underside of the box. And that's the ballgame. 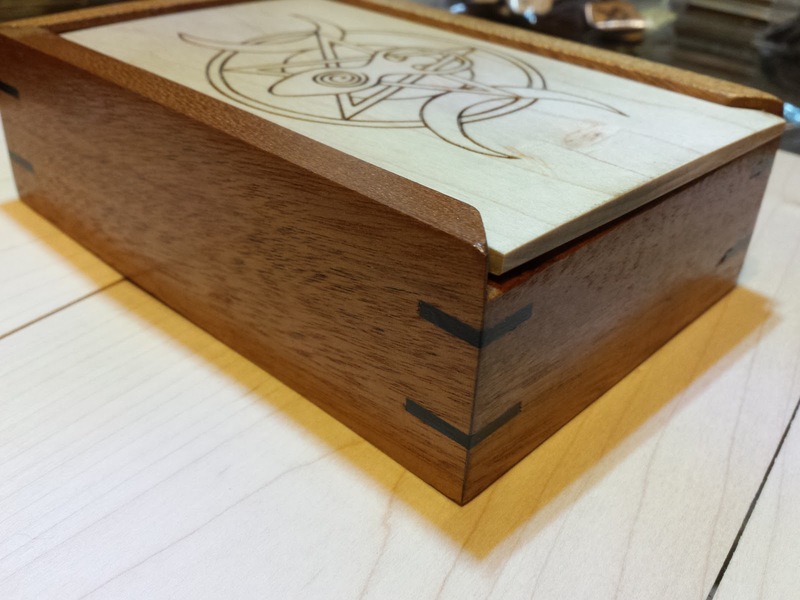 Two sapele, maple and ebony boxes with sliding tops and splined mitered corners. My first real "box" project (not counting the candle boxes). And now, the glamour shots. 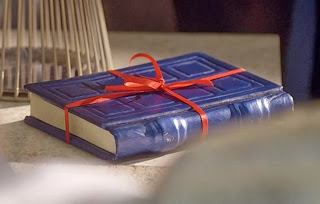 Oh, there is one small detail I left out. You'll notice on the latter pics a small divot on the right side of the lids. 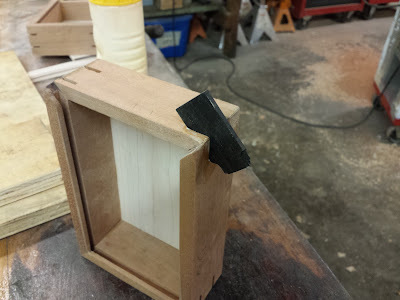 This is a thumbnail groove, to help with opening the lid. 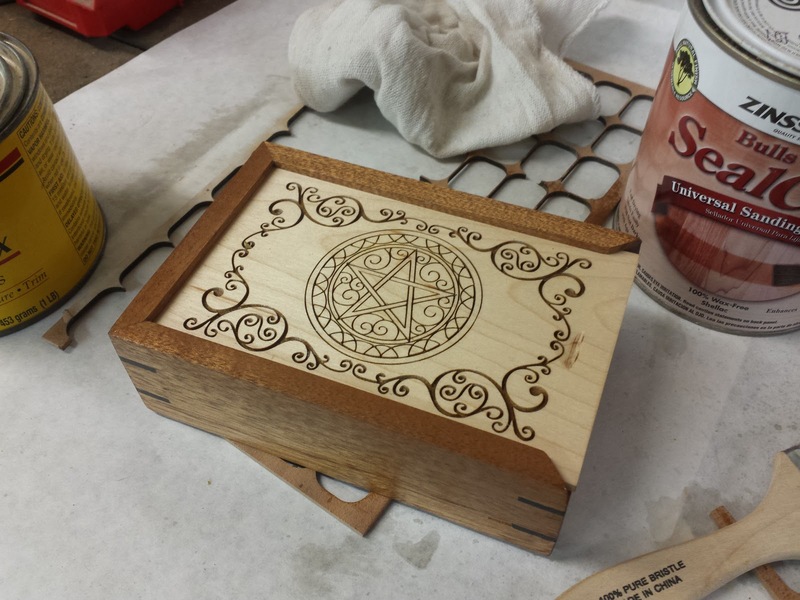 It was made with a small spindle sander on a dremel. I don't really like how it came out. That, and the fit of the lids is my least favorite part of these boxes. But overall, I'm very happy with them. Especially for a first attempt. 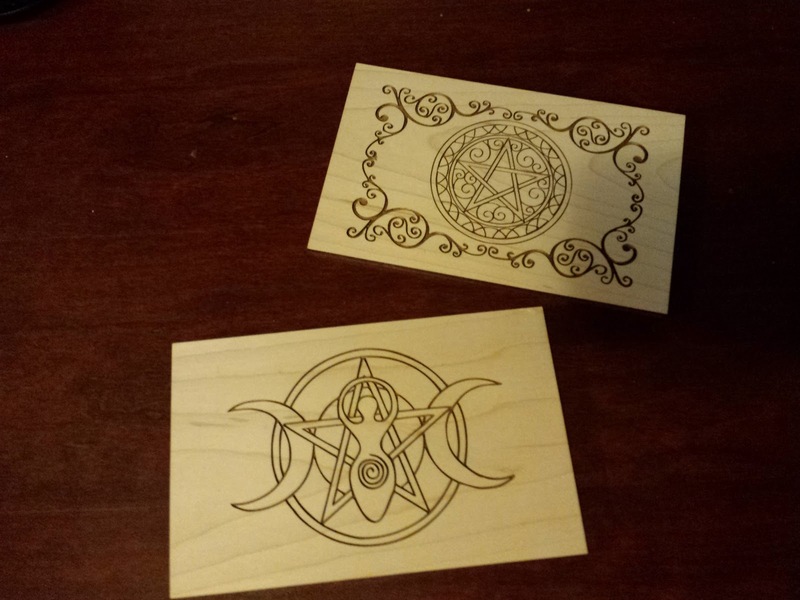 It took me two days to finish them, but I can probably cut that down some with more practice.